Data reception needs to be confirmed (ACKnowledgment packets) before new data can be sent. ACK packets are stalled and delayed by a simultaneous upload. As a result, the download is slowed down as well. ACK packets are prioritized in the upstream, allowing the download to continue at maximum speed. The standard solution so far has been to try and compensate for this by increasing TCP window size, thereby allowing more data to be sent without immediate confirmation. The main problem here is that this also leads to high ping times (latency) and significant delays during Webpage rendering. 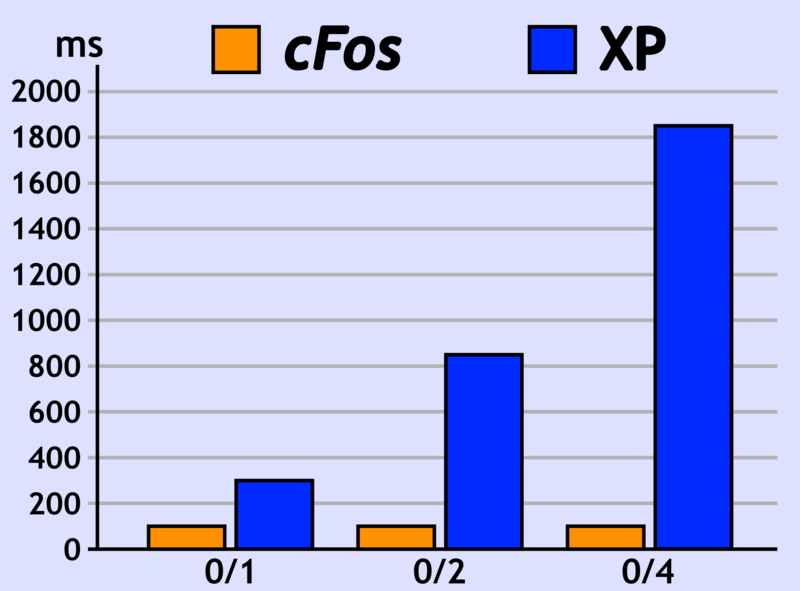 Latency of up to 2 seconds is not uncommon for TCP windows with a size of 512k. In short, huge window sizes just won't let you achieve full download speed. 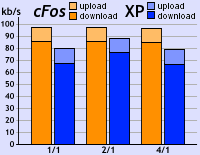 1-4 uploads: While ping times remain consistently low with cFos, the XP driver "slows down the system." Without Traffic Shaping, ping times can easily reach a horrific 2 seconds, which will make participating in Telnet or SSH sessions a chore – if not outright impossible. But with cFos Traffic Shaping, latency remains normal. This alone should make for a totally new surfing experience! It also means that while surfing the Web, you will be hard-pressed to even notice that there are any data transfers running in the background. Again, such drastically reduced latency will come in especially handy for online gaming. But don't take our word for it; just see for yourself. ensures ping times remain low even during downloads, while keeping one download from choking other simultaneous downloads. optimizes TCP/IP acknowledgements, thus making more bandwidth available in the upstream channel. like games while assigning lower priority to others is especially useful when trying to reserve some extra bandwidth for important applications. is improved by recognition and prioritization of RTP packets. like HTTP, FTP, POP3, SMTP, IcmP, SSH, Telnet, and DNS can be done using built-in, programmable filtering rules. Test it on your own! 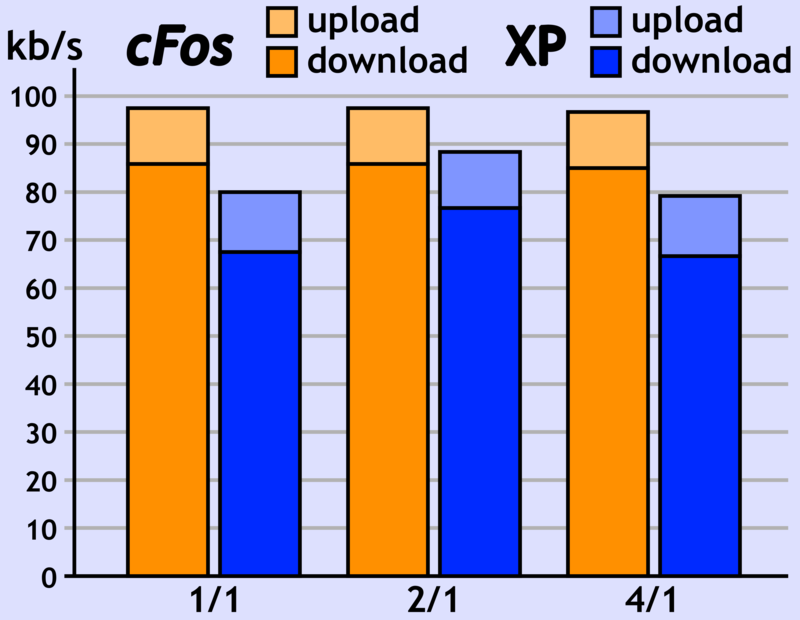 When running one upload and two downloads simultaneously, cFos lets you surf more than three times faster than the XP driver! Both cFos and cFosSpeed will calibrate themselves with respect to the connection. This means best results are usually achieved after having used those programs for several days, during which you should run as many uploads and downloads as possible at full speed.